I want to stay in Probolinggo (Indonesia), but I could only find quite expensive accommodation online and in guide books. That is, everything seems to be 300'000 minimum, which is expensive for Indonesian standards. Is there anything cheap, as in, below 150'000 per night? There are actually many cheaper options in Probolinggo than the ones visible on internet or in lonely planet Indonesia (edition 2013). I stayed in a guesthouse for 80'000 IDR per night, for a double bedroom with shower (cold water only). It was clean, not far from the train station, and staff was nice. The guesthouse is called "female guesthouse", although I'm a male, this name made no difference. Note that I went with my girlfriend. Tampiarto hotel has double bedrooms with AC for 195'000 IDR. Jalan Suroyo 15, Probolinggo. 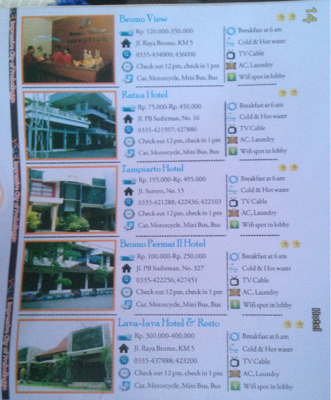 Website of Tampiarto hotel. Hostel Dharma has double rooms without AC for 75'000 IDR, & with AC for 125'000 IDR. Jalan Ikan Kerapu, Probolinggo. I also found another few places with higher standards (i.e. With swimming pool for around 200'000 IDR). Please find below a picture of a flyer from 2015 with different hotels and the relevant prices, address, phone number, and so on. For further info, contact the tourism information office in Probolinggo, they were very helpful when I got in touch with them. Not the answer you're looking for? Browse other questions tagged budget accommodation hotels indonesia homestay or ask your own question. What's the absolute cheapest accommodation in Ioannina Greece? How to find neighboring apartments/self-catering accommodation? Accommodation in South America - book here or just rock up and find there? Cheapest accommodation in Motobu, Okinawa? How can I stay in the center of Paris cheaper than AirBnB?